The native landscape of The Village at Castle Pines, with its stunning groves of pines, natural rock formations, and rolling hills, provide not only majestic views, but also the much sought after privacy and sense of remoteness that is exclusive to mountain living. The Village at Castle Pines was chartered to be a community that embraces the natural terrain, complemented by an infrastructure of highly trained professionals dedicated to providing safety and security services to both residents and guests. The Village is one of only a few luxury gated communities in the country with five, staffed entry and exit gates. The in-house Emergency Services Department provides 24/7 patrol service, alarm monitoring, access control, emergency medical services and home vacation checks as just a part of the many benefits that living in the Village provides. Castle Pines Emergency Services officers are proud professionals, who are highly trained to deliver quality service to residents and their guests. All officers are provided continuing education and training to ensure they are at the forefront of their profession. In addition, all Patrol Officers are EMT trained and have duty-related experience. 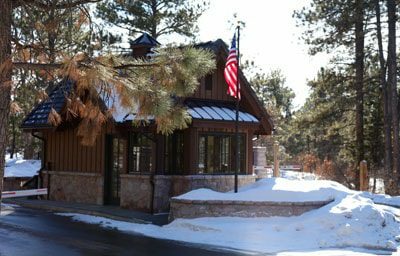 The Homes Association of The Village at Castle Pines takes great pride in the services and benefits provided to residents and we invite you to learn more about life in the Village.